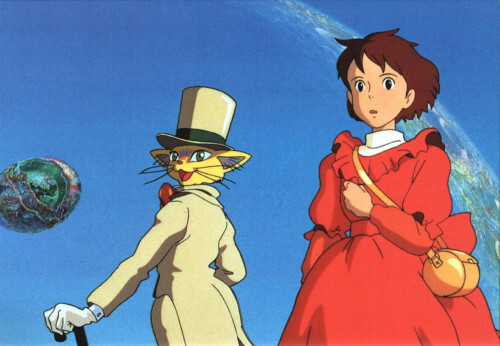 Baron Humbert von Gikkingen is a cat figurine in the movie “Whisper of the Heart” [耳をすませば] that comes alive in the fictional story of the young girl Shizuku. 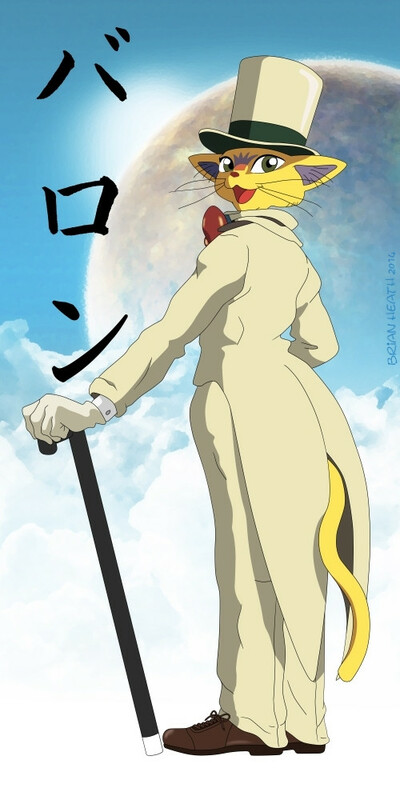 The cat, also simply known as Baron is featured in the sequel movie “The Cat Returns” but in a different apperance style. This is the pose I was using for my image. Unfortunatelly whe whole bottom section is missing and I had to recreate it by myself. Now slowly I have to start drawing more and more elements by my own. While Nausicaä has been a full template, Lady Eboshi already took some modifications and now I had to add even more on my own. For reference I was taking some images of the statue itself and other movie scenes. The image is split in four layers: contours, colors, text and background. The background is a falce color image of a Jupiter moon mixed with some clouds in front. In the end a aquarel filter has been applied. The contures are print on foil and will be colorized soon.